Like all the other big sports, hockey fans love their gameday gear and jerseys are the top option for most fans. 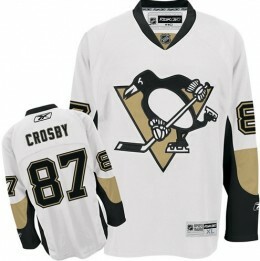 Similar to basketball jerseys, hockey jerseys are somewhat limited in their year-round usage. They were called sweaters for a reason, and still include a thicker fabric than most other sports, with long sleeves. However, this does not present as much of a problem since the hockey season runs during the colder months of the year. With several versions and multiple tiers of pricing, shopping for hockey jerseys can be confusing. Our helpful guide aims to clear up any misunderstanding so fans can make an educated and confident purchase and celebrate their favorite team or player with an NHL jersey. Reebok EDGE Authentic jerseys are the top retail option for fans looking for high quality materials and craftsmanship to support their favorite teams and players. The jersey is composed of 250-gram double-knit polyester spandex fabric. The spandex allows the jersey to stretch and make for a tailored fit. Just like the jerseys worn on the ice, there is a authentic fight strap sewn into the jersey. This strap can be attached to the pants and helps the wearer from losing his jersey if he gets into a scuffle. Lastly, the authentic Reebok jerseys are treated with Bead Away, which is a water repellant. One key element of authentic jerseys is the graphics and lettering. Each jersey features sewn twill numbers, names, and team graphics. They also include the NHL shield sewn on the bottom of the front collar, and the Reebok name embroidered on the back of the neck. The final thing to look for is the RBK/NHL Center ice neck label and jock tag. The neck label should be woven into the inside of the jersey and the jock tag is found on the lower left bottom of the jersey. This premium authentic jersey will normally cost between $250 and $330. Although a step down from the authentic jerseys, Reebok Premier jerseys are intended to replicate the appearance of the authentics, while sacrificing somewhat on materials. The Premiere jerseys use a thinner 175-gram polyester fabric with an athletic cut and some stretch. They walk the balance between being fashionable and practical. The team logo on the front is still sewn on, but the name and numbers on the back are screen-printed. Just like the authentic jerseys, RBK/NHL neck labels are found inside the jersey and the jock tag is applied to the lower left of the jersey. The official NHL shield patch is sewn into the bottom of the collar and the Reebok name is embroidered on the back of the neck. 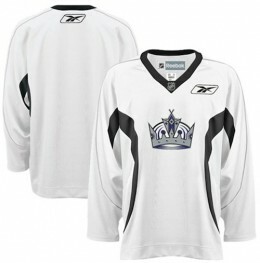 Reebok Premier jerseys use small, medium, large and extra-large sizing and that is reflected on the jock tag. Prices generally range from $125 to $170. Reebok practice jerseys may not look as realistic as the authentic or Premier jerseys, but they are the most budget-friendly way to support your team with an official jersey. These low-cost alternatives replicate the on-ice jerseys worn by players during practice. The practice jerseys feature mid-weight, 100% Ultrafil polyester, and screen-printed twill numbers and letters, that are heat-pressed on the jersey. The embroidered team crest is heat sealed on the front of the jersey. Like the authentic and Premier, the NHL shield is sewn on the bottom of front collar. The Reebok logo is embroidered on the back of the neck and the front left chest, and an RBK/NHL woven neck label. Unlike the Premier and authentic jerseys, the practice jersey does not include shoulder patches. The practice jersey features standard sizes and costs around $90. CCM is the official maker of vintage-style NHL jerseys, Heroes of Hockey, that highlight players and teams from the past. Their quality is similar to the the Reebok Premier jersey. Front logos are sewn on while back letters and numbers are screen printed. 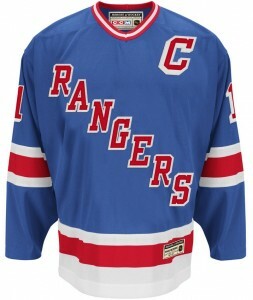 Fans can expect to pay $110 to $185 for a CCM Classic hockey jersey. While the internet is a great resource for tracking down NHL gear, it is good to be aware of the possibility for fake or knockoff jerseys. While they can be a great cheap option, if you think you are getting the real deal and end up with a fake, it can be very disappointing. There are few things to look for when checking out a potential purchase, that can help you avoid purchasing a fake when you believe you are getting an official jersey. Extremely low price, unless the player is a bust or has been traded or cut. Poor overall quality and stitching. Lack of of official tags and logos as referenced above. Stock images or low resolution can be indicative of a fake. It is always good to request detailed photos of the actual item you are buying. Jerseys that are made in China. The newest versions are all made in Indonesia, but earlier versions were made in Canada. Although it may be less obvious, fakes generally have clearly different fonts on player names and any text on the tags. Also, misspellings are a dead giveaway. Hi Sir, i have a question regarding an old jersey.it was given to me by my brother back in 1999.i would like to know the value of San Jose Sharks number 22, Dahlen is the Surname..Starter Brand, XL size.Western Conference. Your answer is a great help. Thanks in advance. I can provide you pictures if you wish to. I’m looking for Winter Classic 2011 Penguins authentic. I saw one that looked legit. My only concern is its a size 48. Did Reebok ever produce a size 48 retail authentic ?